Mozzarella stuffed Italian meatballs are a savory, perfectly seasoned blend of meat wrapped around luscious, melted mozzarella! Scrumptious! If you like meatballs, you’re sure to LOVE these! 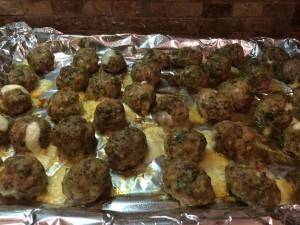 Although the above photo doesn’t show it, each meatball is stuffed with a small piece of mozzarella that is a yummy surprise with every bite. The photo below is how these look fresh from the oven. They have a browned, rustic exterior, with some oozing mozzarella and others staying sealed. 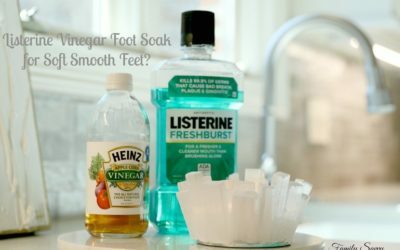 I ate at least five of these just standing at the kitchen counter; they were so delicious! 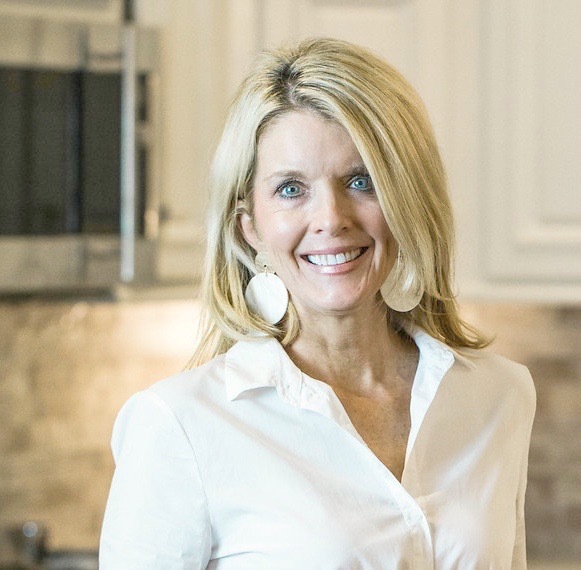 The Meat: I love using ground pork and ground beef, as the combination gives interest and great texture. I have used ground veal in the mix before, but I actually prefer the beef/pork only combo. The Mozzarella: For convenience’ sake, I cut string cheese into small nibs, but fresh mozzarella would take these over the top. Cutting soft, fresh mozzarella into small cubes would take more time and effort than slicing string cheese, but it would have to be 100 times tastier! 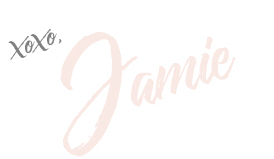 If anyone tries it, let me hear from you! The Panade: The secret to keeping ground meat tender for meatballs, meatloaf, burgers and more, is a panade~a milk soaked bread mixture. Soaking the crumbs while prepping the rest of the ingredients will make a panade that will yield tender meatballs. The egg & seasonings: Whisking the eggs with all seasonings cuts the time needed to maniupulate the meat (which makes it tough). 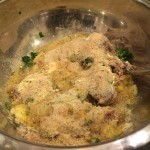 Adding the Parmesan to the egg mixture before mixing with the meat also helps blend flavors more evenly. 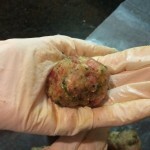 The mixing: The key to tender meatballs is to mix the meat until just combined~and no longer. This is why mixing the other ingredients together before adding to the meat is a good idea. I wear gloves and use my hands to mix, but for the squeamish, a firm spatula or spoon will work fine. These savory, flavorful meatballs stuffed with mozzarella are absolutely oustanding! Place breadcrumbs in small bowl; pour milk over. Add olive oil to a medium skillet and heat to medium-high. Add onions to skillet and sautÃ© until tender, adding minced garlic last 30 seconds of cooking.. In a large bowl, place meat. Whisk eggs, parsley, Parmesan, salt, oregano, thyme,basil & red pepper. Pour egg mixture over meat. Mix until egg is no longer visibly yellow. Add onions/garlic and soaked breadcrumbs; mix in well. 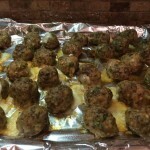 Using small cookie scoop, shape meatballs into equal sized portions. 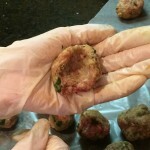 Make small indention in each meatball with thumb. 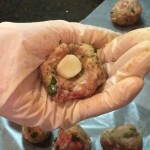 Place mozzarella nib inside indention; seal meatball to completely cover cheese. 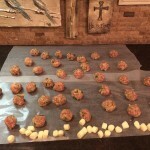 Place meatballs on parchment lined cookie sheet, and place into oven. Cook for 30-35 minutes, until meat thermometer registers 165 degrees. Cover in marinara and serve over pasta. After cooking, cool for half an hour before placing in freezer on cookie sheet. 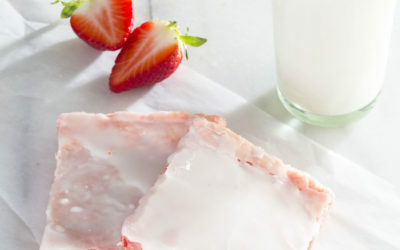 Freeze on cookie sheet for at least an hour or up to 3 hours (to prevent sticking together). 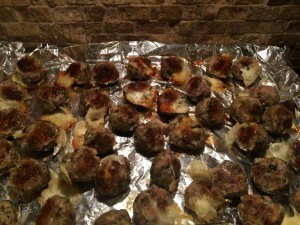 Remove from freezer; place meatballs in freezer ziploc bags, removing as much air as possible. 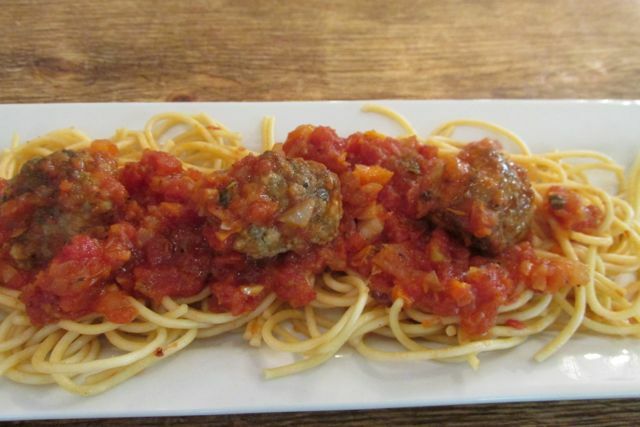 To cook from frozen, add meatballs to sauce and simmer until heated through.